Raman spectroscopy involves delivery of a high intensity of laser light to a very small focus, while simultaneously requiring sensitive detection of less than one-millionth the number of scattered photons. How that light is delivered to and collected from the sample has a significant impact in the quality of data that can be collected, and the ultimate sensitivity of the system. Fiber coupled probe & spectrometer, free-space coupled spectrometer with custom optics, or system with integrated laser – the choice depends on your sample type, environment, and the user. In this tech tip, we’ll discuss the pros and cons of each sample coupling approach, and how to get the best results. Regardless of your needs, Wasatch Photonics offers a sample coupling option that can be optimized to your application. Optical fiber routing greatly simplifies Raman system setup by fast-tracking the alignment process. The Raman probe is mated to the spectrometer’s SMA port and laser (typically an FC port) with a few quick twists, upon which measurement can commence. This is ideal for work in the field, and makes Raman spectroscopy more friendly for teaching labs. Rather than carefully aligning the sample to a spectrometer port, the probe tip can be brought to the sample, facilitating measurement of irregularly or awkwardly shaped solid samples and biological specimens. It can also be mated to a cuvette or SERS (surface enhanced Raman spectroscopy) substrate. The downside of fiber coupling is that it carries higher losses than a free-space optic design. Autofluorescence within the fiber due to the excitation laser must also be filtered out, and can add background noise to the measurement. Incompletely filtered laser light can do the same if not properly dealt with in the probe head design. spectrometers use f/1.3 optics to capture more light than typical f/3 to f/4 diode array spectrometers, and keep and detect more light using a high-efficiency optical design based on diffraction-limited, transmissive AR-coated optics. Our Raman spectrometers have a 0.36 NA input, which is not fully filled when mated to standard 0.22 NA multimode optical fiber. 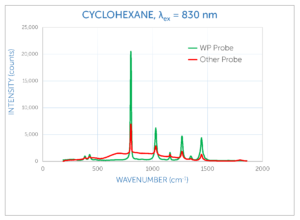 While our Raman spectrometers can still offer good SNR when used with a 0.22 NA probe, they truly shine when mated to our own 0.36 NA Raman probes. Designed for maximum transmission and coupling efficiency and minimal background noise through the use of careful filtering, our Raman probes deliver far superior SNR when used with our spectrometers, and are available at all available excitation wavelengths. 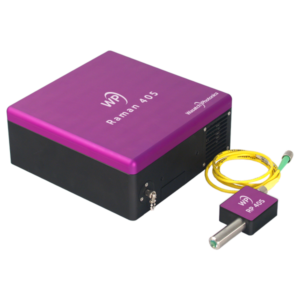 Choose from our fiber coupled Raman probes, spectrometers, and lasers for wavelengths from visible to NIR. A free-space coupled spectrometer has a cylindrical coupling port which offers a 0.36 NA field of view (~42° cone). This requires the user to perform all alignment of laser to sample and sample to spectrometer collection port, and is thus impractical for field use. This configuration is most often used by researchers and OEM system designers who wish to have full freedom and control over the design of the sampling optics, from spot size to working distance. Wasatch Photonics’ low f/# spectrometer design offers these users superior signal and with it, throughput and sensitivity. This can be of particular benefit in high-throughput process line or scanning applications. 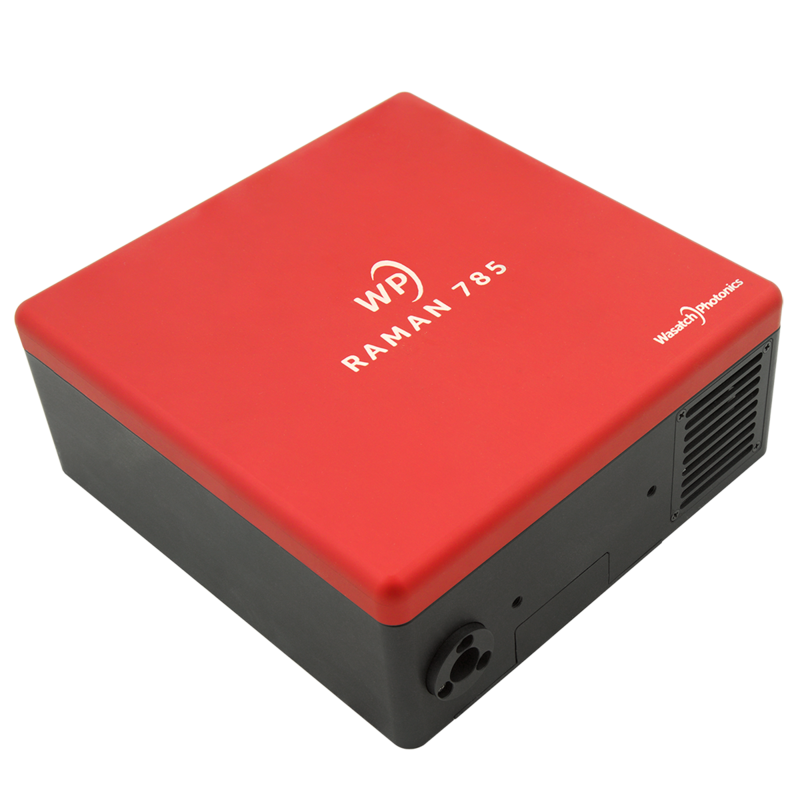 All of our Raman spectrometers are available with free-space coupling inputs. For the best possible signal to noise and sensitivity in the smallest footprint possible, choose one of our turnkey integrated Raman systems, available at wavelengths from the visible to NIR. A turnkey Raman system simplifies operation for the user, integrating laser control through the software for safety and convenience, and also enabling automated or remote measurements. We’ve optimized the sample coupling optics of our integrated Raman systems to deliver a 50 μm laser spot at a standard 25 mm working distance. 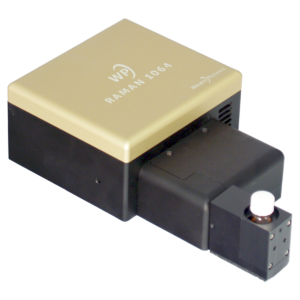 Raman signal collection takes advantage of the spectrometer’s full f/1.3 field of view for maximum sensitivity at the shortest acquisition times. An OD 6 laser rejection filter blocks unwanted scatter back into the system, passing Raman signal above ~200 cm-1 (depending on excitation wavelength). Use of high efficiency optics, careful filtering, and internal stray light management ensures that our integrated systems offer low background and noise, comparable to a matched NA probe/spectrometer system design. 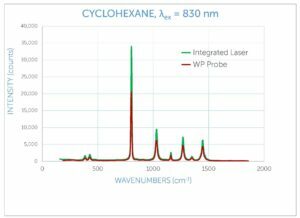 As can be seen at right in a comparison of cyclohexane studied with 830 nm excitation, the integrated system outperforms a modular spectrometer/probe system in terms of signal level. This has tangible benefits in limit of detection, as can be seen in the case study below. 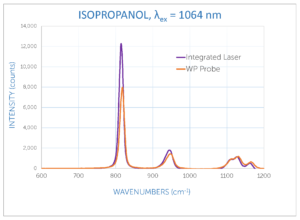 To compare the difference in absolute sensitivity of a probe-based vs a system configuration, we tested limit of detection (LOD) and limit of quantitation (LOQ) for isopropanol in water using the WP 1064L Raman system with quick-fit cuvette holder accessory against a modular WP 1064 spectrometer configured with 1064 nm laser and an RP 1064 Raman probe. Use of our quick-fit cuvette holder allows the full f/1.3 aperture of the spectrometer to be utilized and minimizes optical coupling losses, resulting in higher signal than the probe-coupled configuration. To quantify the increase in sensitivity, we measured a dilution series of isopropanol in water at concentrations from 0.1 – 100%, calculating the limit of detection (LOD) and limit of quantitation (LOQ) according to the method described in our tech note, Fluorescence Limit of Detection. For the purposes of this study, LOD is defined as the concentration at which signal to noise ratio (SNR) equals 3:1, while LOQ is defined as the concentration at which SNR=10:1. The turnkey integrated Raman system offers an improvement of a factor of 2x in the LOD over a probe-based system, and a fractional improvement in LOQ. While our off-the-shelf integrated Raman systems are ideal for lab use and proof of concept, we also produce more streamlined, custom optical designs and system footprints for OEM integration. Explore our expanding line of integrated Raman systems. 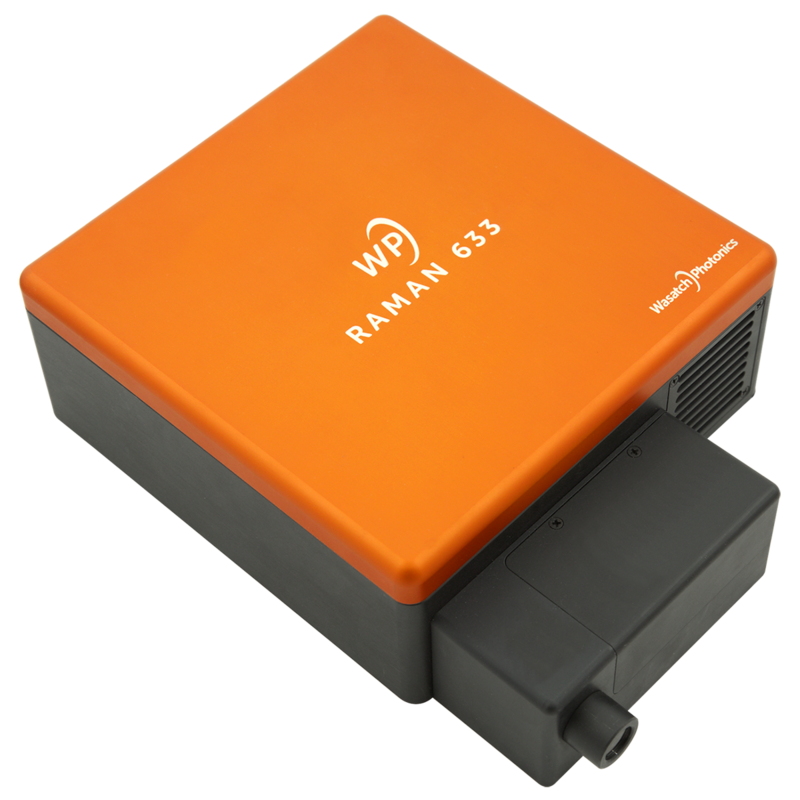 At Wasatch Photonics, we believe you should have full control and maximum flexibility when designing a Raman spectroscopy system. That’s why we offer so many build-to-print options for range, resolution, detector cooling, and sample coupling – backing each with our advice and experience, and technical notes to guide your system design. Let us help you create the system best suited to your needs. Download the brochure, or contact us today.